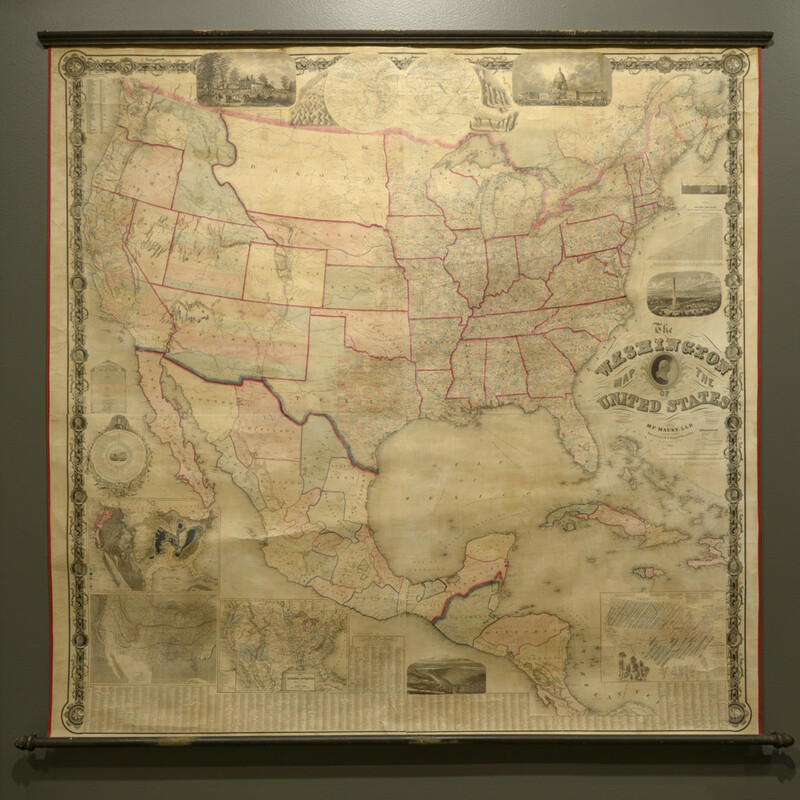 Westward expansion, immigration, and military conflicts made the study of maps a priority in the lives of men, women, and children during the antebellum decades and beyond. Major surveying projects and advances in printing technology—such as the invention of lithography and the steam-powered rotary press—turned maps into an industrial product. Mass production ensured universal access, and maps were transformed into a flexible consumer good. They addressed diverse needs. School and thematic maps showing gold fields and election campaigns competed with miniature guides and gigantic overviews. 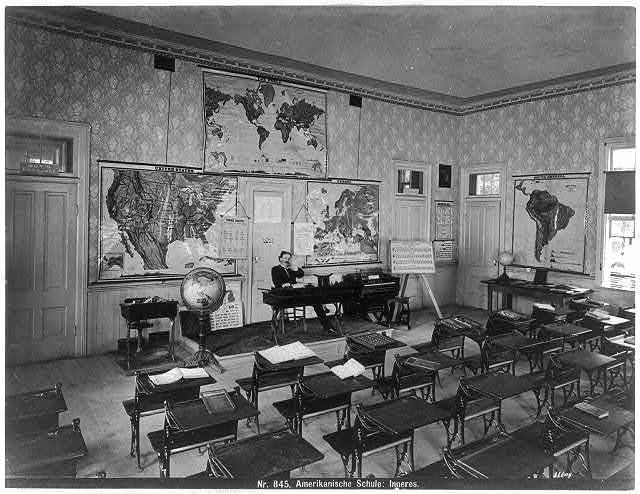 Long before the Civil War, wall maps had become permanent fixtures in schoolrooms. 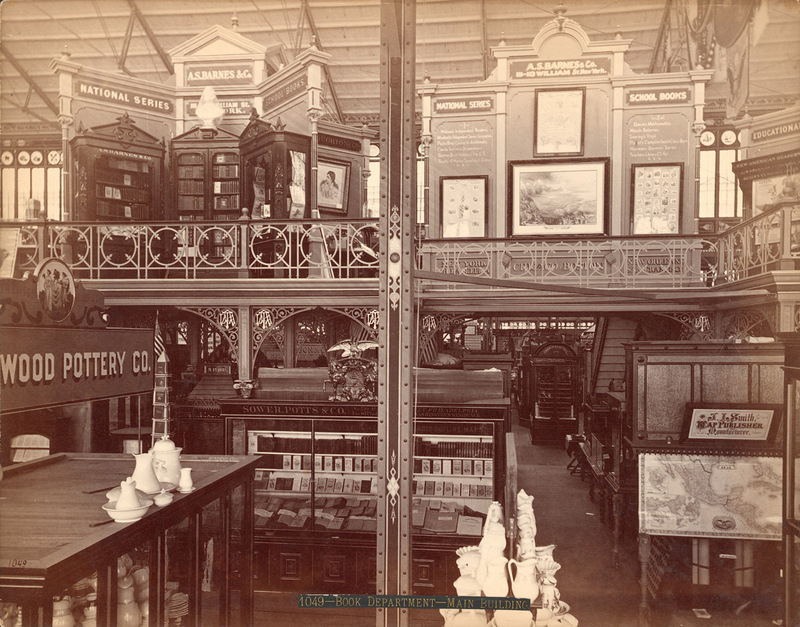 They even entered window displays in America’s first shopping districts and were feted at commercial fairs, including the 1853 Exhibition of the Industry of All Nations in New York City’s Crystal Palace. Publishers like Horace Thayer & Company sold wall maps in the tens of thousands. Their Pictorial Map was popular for patriotic and pedagogic reasons. 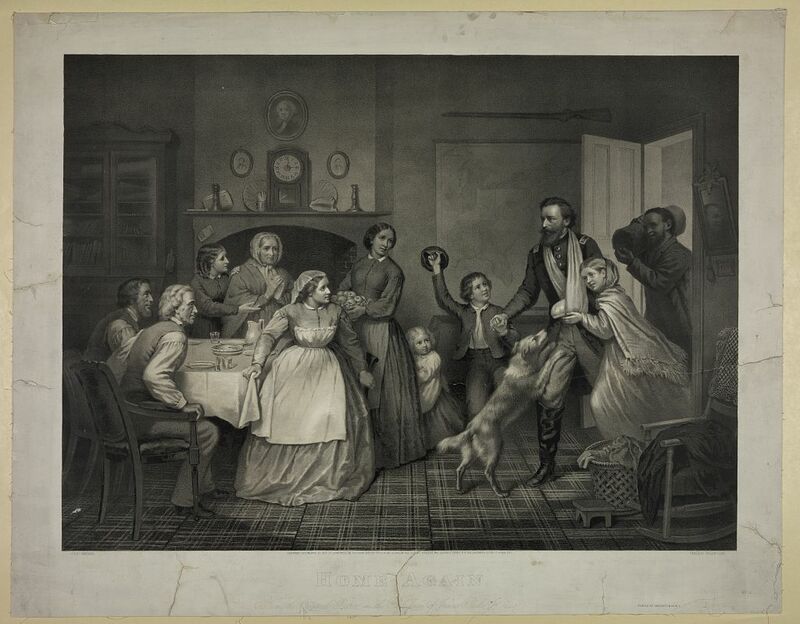 Scenes showing historical events and battles frame the nation’s territory from coast to coast. Two large iconographic inserts commemorate contributions made by the American military and farmers. 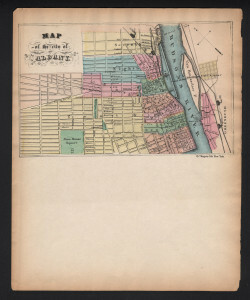 In this early stage, the map calls San Francisco “Yerba Buena,” but the colorist did anticipate the California Gold Rush. Since the early 1800s, states and regions have been distinguished by specific colors. 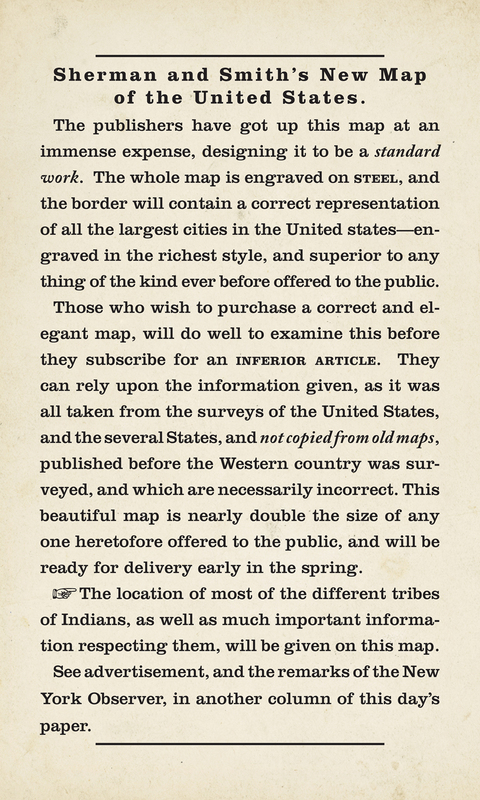 On the eve of the Civil War, colossal maps measuring on average seven-by-seven feet showed North and Central America. 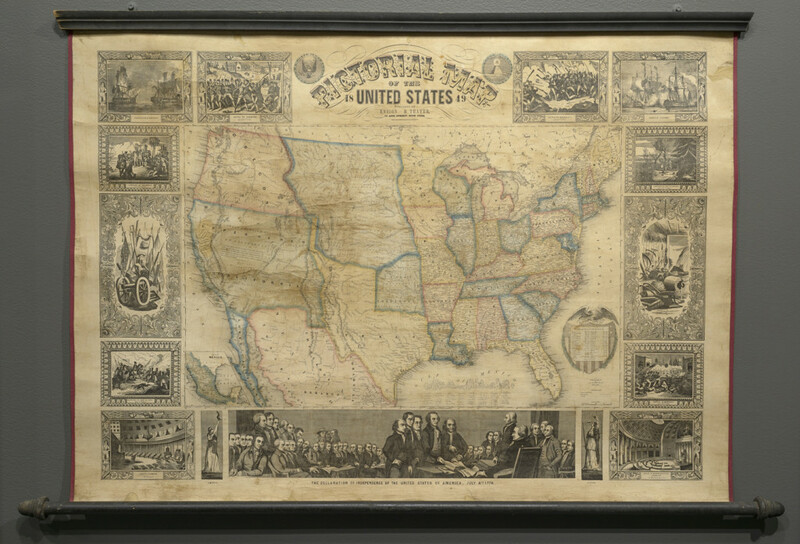 They were intended for public display in schools, offices, train stations, and city halls and showed the United States in full color by county. Matthew Maury’s map is unique because it contains information usually found only in books. While it depicts settlements, transportation routes, and county boundaries, inserted tables also show distances, state sizes and date of admission, miles of railroads, population, the breakdown of churches by denominations, and time differences. 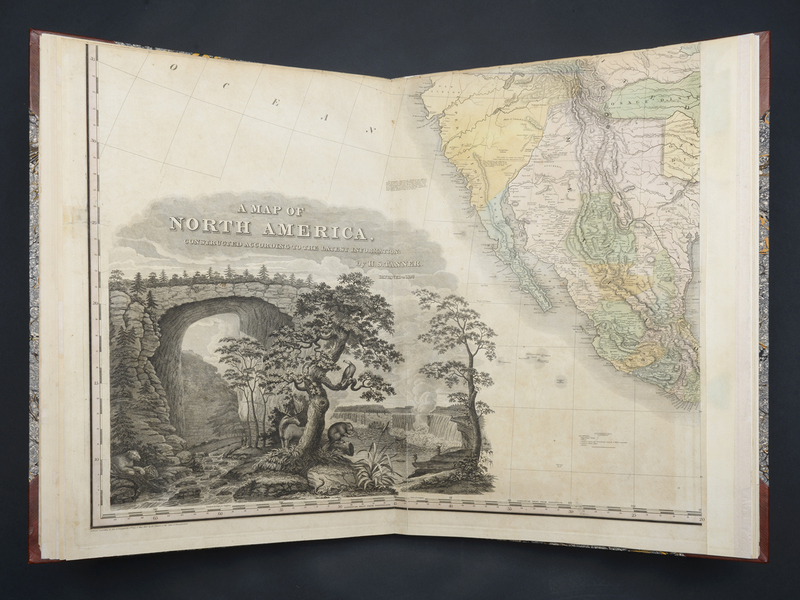 A series of diagrams depicts North American geology, climate, wildlife, food crops, plants and trees, and comparative topographic profiles of mountains and waterfalls. The decorative frame of the map, consisting of a ribbon and grapevine pattern, supports a gallery of portraits showing the first sixteen presidents. 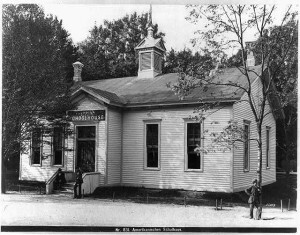 Abraham Lincoln can be seen in the lower right. Maury’s name was dropped from the map in subsequent editions because of his support of the Confederacy, indicating that maps were frequently at the center of political and personal turmoil. 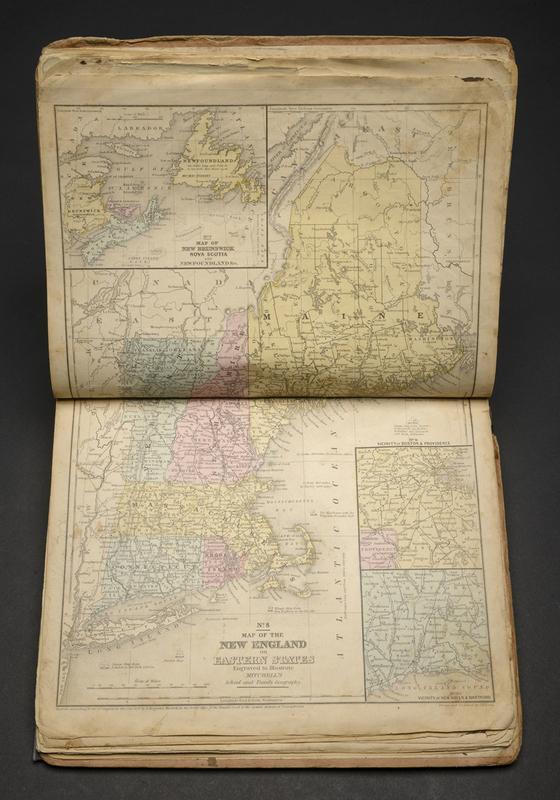 Published by D. R. Smith & Co.
County maps depicting patterns of landholding and local geography emerged in the early 1800s. The product of private enterprise, they illustrated the ownership of all land parcels within the rural parts of a given county. 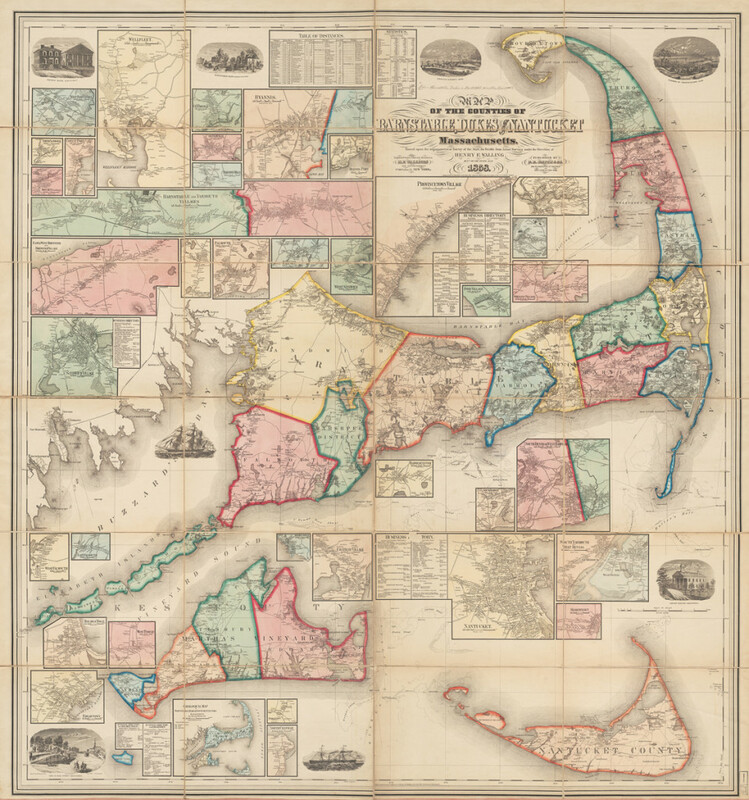 The maps gained popularity because they catalogued the distribution and individual ownership of real property in an era of great population expansion, social mobility, and economic development. Few details concerning the origins of this map are known, but we do know that roads were measured with a wheel odometer, pushed by a wheelbarrow-like device or drawn by horse and buggy. The map pinpoints the names and locations of every residence, workplace, church, and school. 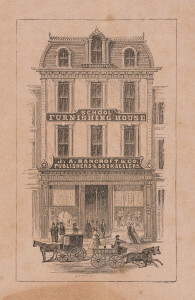 A typical mid-1850s price was $5 per copy. 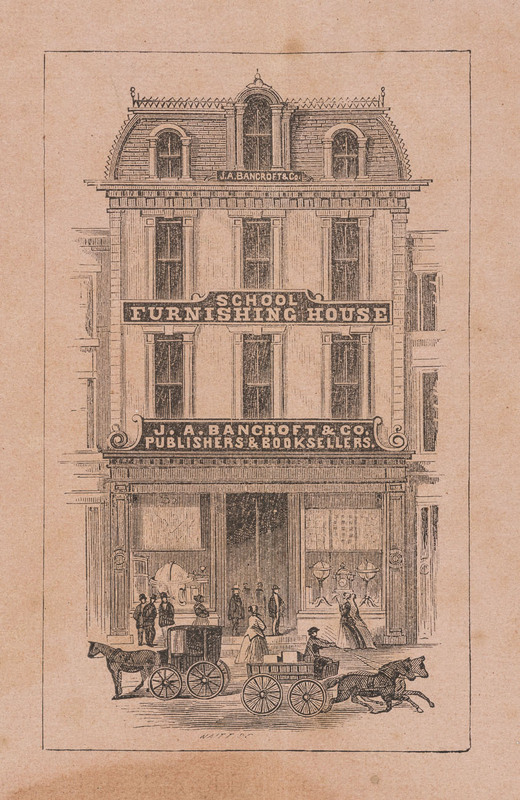 Prominent citizens allowed their names to be used in the map’s advertisements, testifying to the merits of the product while ensuring its financial success. Pictures of their homes could be added for a fee. 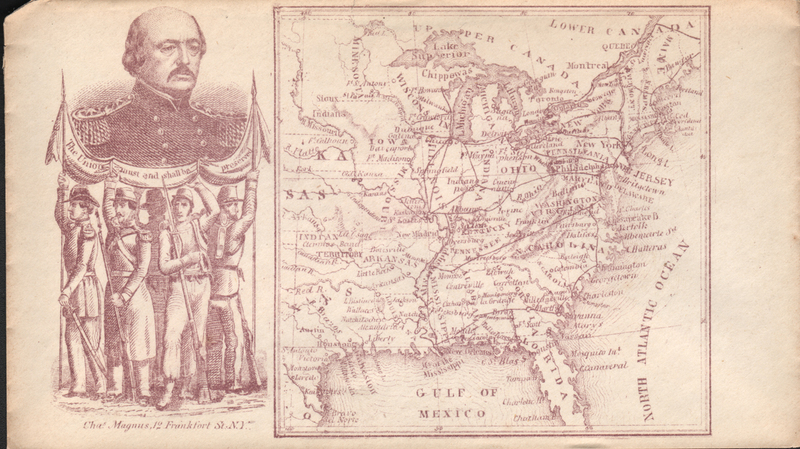 Henry Schenck Tanner’s drawing style affected the look of maps during the first half of the 1800s. Crisp lines and carefully spaced lettering not only made his maps more legible but transformed them into attractive display objects and even collectibles. 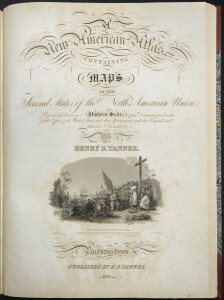 When Tanner published his maps in the New American Atlas, his edition contained the most accomplished depictions of America yet to appear in print. Of the greatest importance were the maps showing the states. 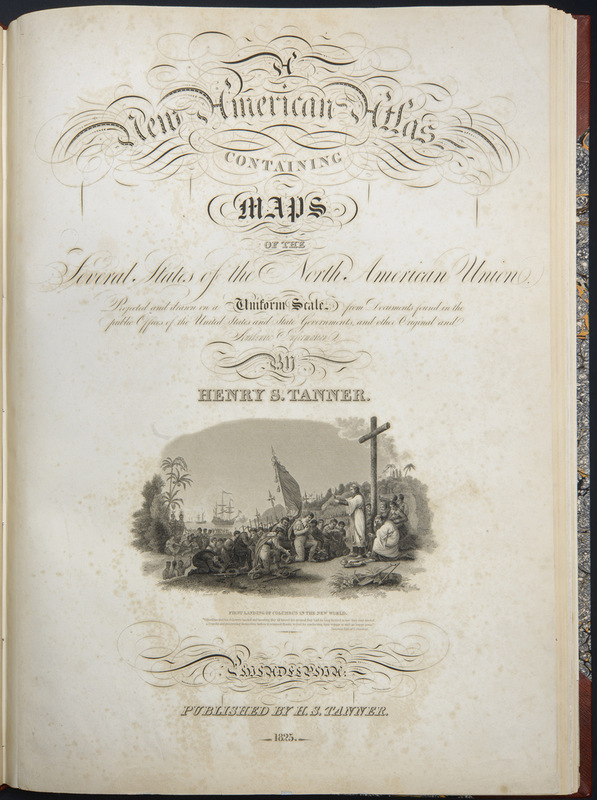 Highly detailed and brilliantly colored, states such as New York and Florida had their own dedicated page. 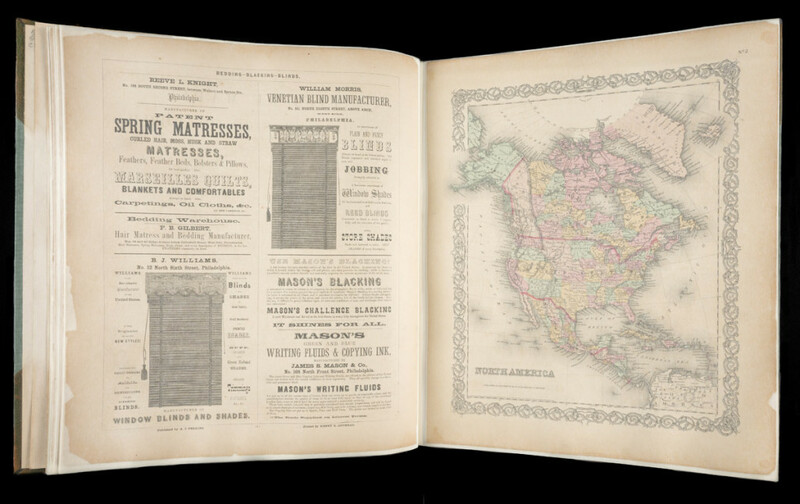 Other double-page sheets showcased multiple states at a time. Often as I sit musing by the quiet fire, do my eyes seek the map which hangs upon the wall before me,—and as they rove over each familiar coast, they like many another adventurer of the times, suddenly dart away, . . . seeking a friend, yes a dear brother, who has gone before us to this golden shore. The growth of the transport, tourist, and communication industries in nineteenth-century America affected the design of maps. 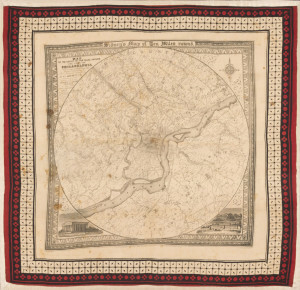 Maps made for overland travelers up to the 1840s gave equal emphasis to roads, rail, and waterways. As railroads came to dominate the travel landscape, however, roads and canals disappeared from railroad maps. Catering to the needs of coach, rail, or steamship promoters, map publishers developed a cartographic style that contorted geography and scale in order to reflect a company’s interests but also take into account the travelers’ desire for identifying their location. This selection shows the versatility of travel maps. 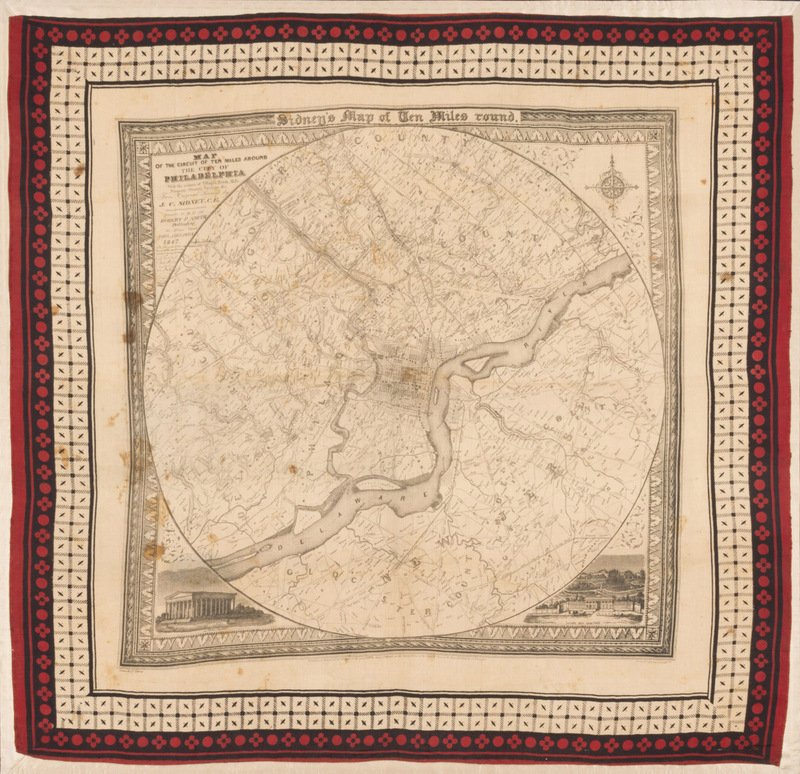 They were conceived as portable objects ranging from the fold-out pocket map to the colored handkerchief map. Printed on envelopes or letterhead, map images playfully reminded the reader that they were essential for communication and transportation. A person who is not qualified to teach geography, grammar, and geometry, and not well recommended for his morals, &c. is forbid, under heavy penalties by law, to take charge of a school. 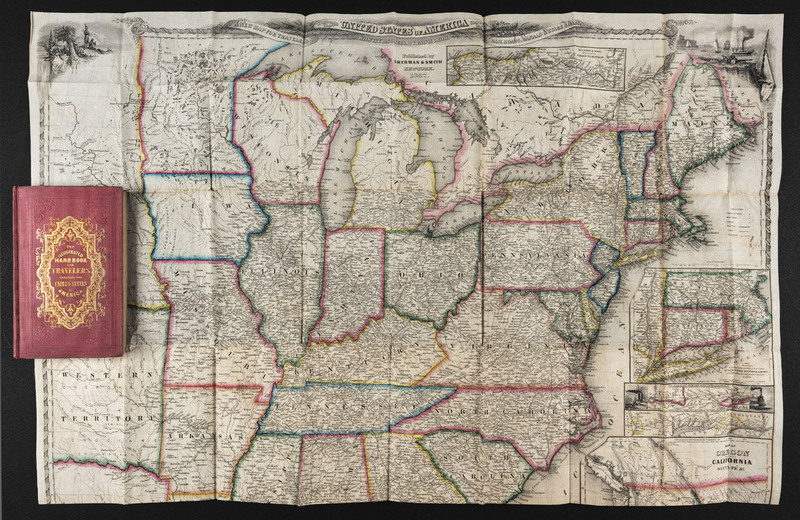 Although American colleges eliminated geography from their curriculum during the 1810s and 1820s, they retained map knowledge as part of the entrance examination. This change pushed map instruction into the lower educational levels. As a result, business leaders, teachers, and parents lobbied for the permanent inclusion of geography and mapmaking in primary and secondary schools. Thanks to the inexpensive school atlas and geographical question book, students across the nation embarked on lessons dominated by the recital of place names and exercises in map drawing and coloring. 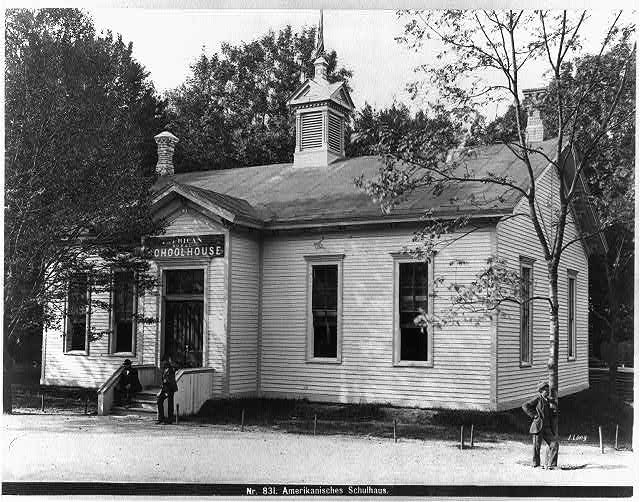 That maps had become synonymous with American democratic culture was the message sent by the United States when submitting the “American rural schoolhouse room” to the Universal Exhibition of 1873, hosted in Vienna, Austria. Geography being now esteemed an essential part of General Education, no expense is spared in procuring books and maps to facilitate the study. The Industrial Revolution changed map production and consumption on a grand scale. 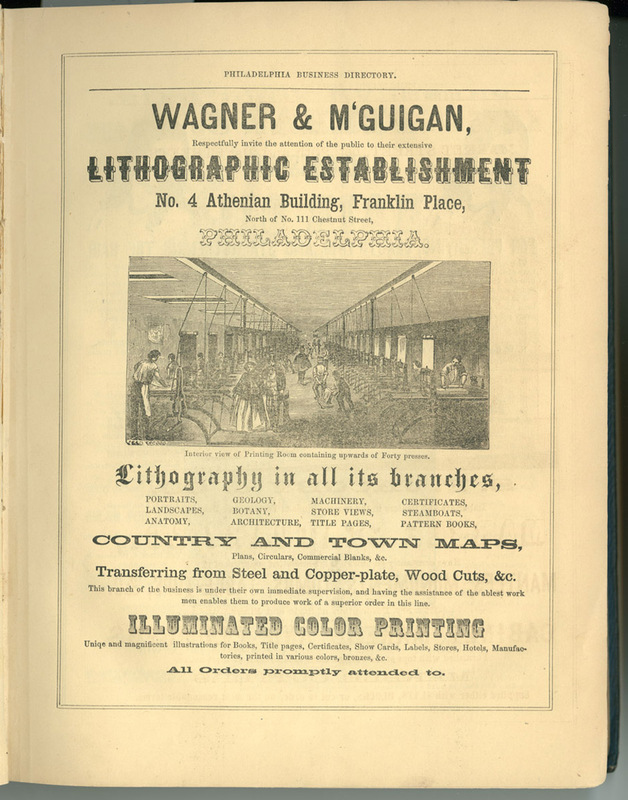 Map publishers employed a workforce consisting of authors, compilers, draughtsmen, and engravers working on copper, steel, wood, and stone. 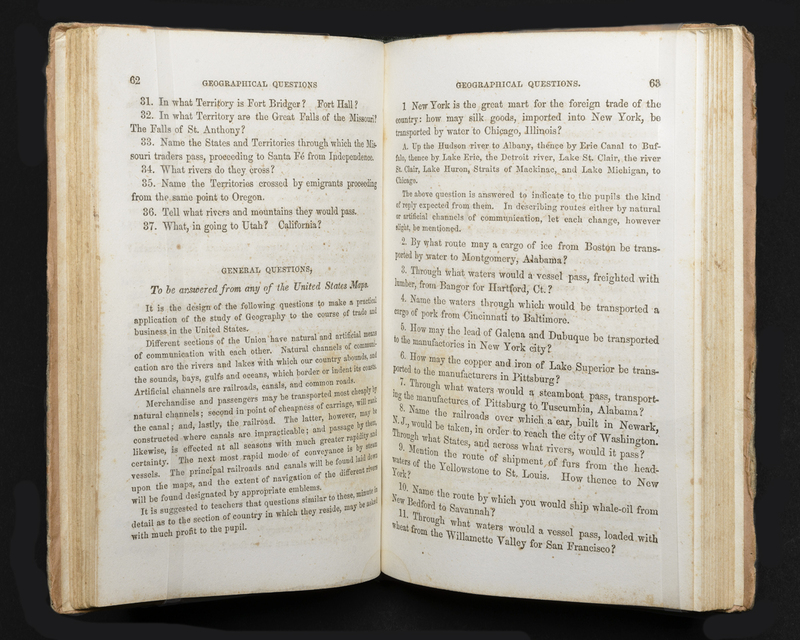 With the introduction of steam power, printers increased their output from twelve prints per hour to nearly one thousand during the 1820s and 1830s. Millions of maps were produced on a single day after the invention of the rotary press in 1843. The enormous output forced a greater standardization in titles, image size, and coloring. In the world of retail, newspapers were full of ads announcing the latest map or atlas, including a railroad map measuring 25-by-17 feet. 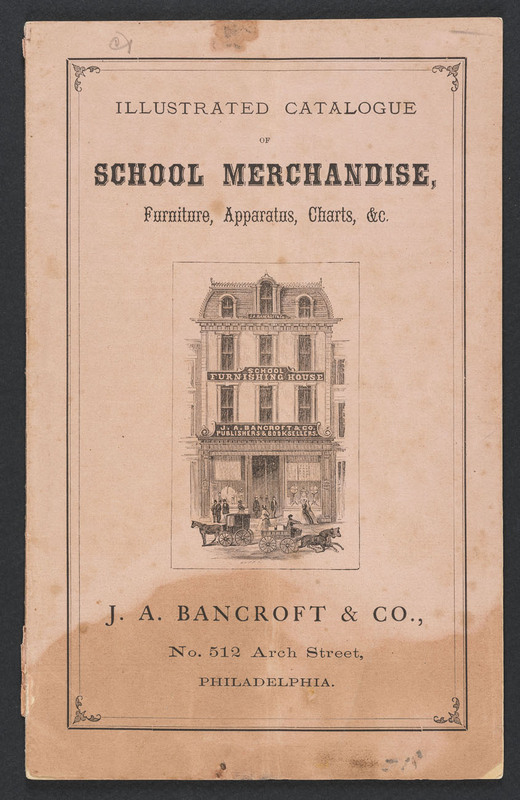 After the Civil War, map shops emerged all over the country, staging goods to attract window shoppers. At the 1876 Centennial International Exhibition in Philadelphia, maps were prominently featured in exhibits devoted to American books and the art of printing. In every house and shop, an American map has been unrolled, and daily studied, and now that peace has come, every citizen finds himself a skilled student of the condition, means, and future, of this continent. 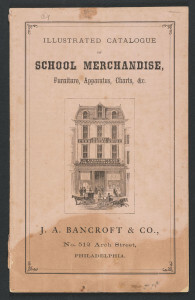 Printed by W. Endicott & Co.